In order to legally sell honey, beekeepers must follow state regulations for labeling their honey. There are also regulations for producing cosmetics such as lotions and lip balms. It doesn’t matter if you are selling from your home, at the local farmer’s market, the state fair, or a grocery store. The regulations and labeling requirements are the same. Luckily, there are many resources that will tell you what you need to include on your labels. A February 2016 article in Bee Culture Magazine provides some great general information related to creating labels for your honey. The requirements for honey labeling in Kentucky can be found on the Kentucky Department of Agriculture’s website. 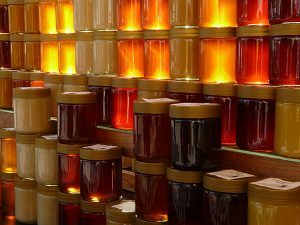 Regulations related to producing cosmetics from honey, beeswax, and related hive-products can be found in the Commercial Food Manufacturing in Kentucky – A Starter Guide, Revision: April 2016.